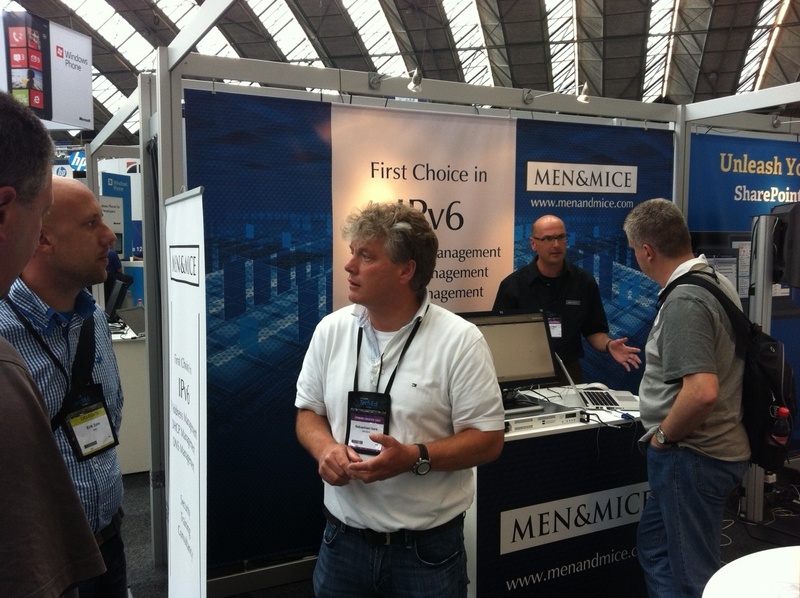 We have been having loads of fun in TechEd Amsterdam in the last couple of days, but the fun isn't over yet! Our very own Carsten Strotmann has been demonstrating a live managing of a DNSSEC signed zone, which has been eye-opening and informative to many guests. Our staff is ready, willing and able to assist, teach and inform in any way they can, so we encourage you to swing by our booth (nr. 66) and see if there isn't something new to be seen and learned! We'll be here until the 29th. We have brought with us our brand new product, the DNS Caching Appliance. Click here to learn more! Mr. Sebastiaan Kors from our reseller partner, WeSecure and our own Mr. Martin Metz really know their stuff! 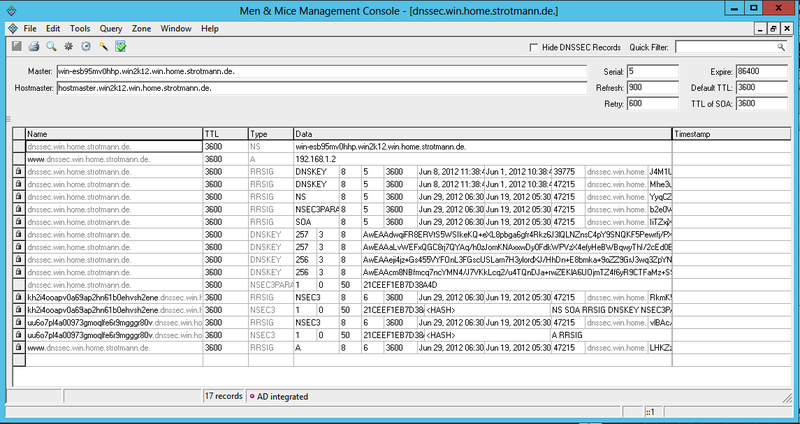 Men & Mice Suite managing a DNSSEC signed zone on Windows DNS 2012 ( see it live @ TechEd Europe 2012 next week in Amsterdam). 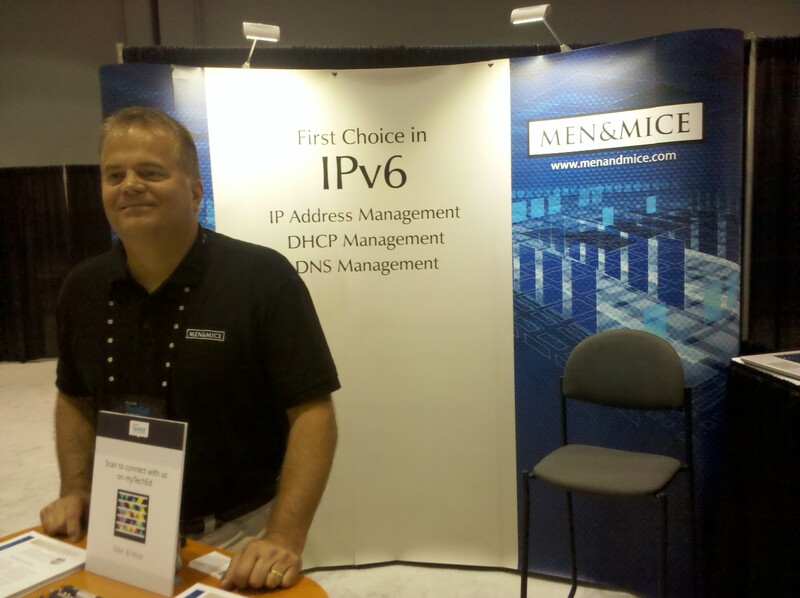 We here at Men & Mice have our US reps in place at TechEd North America in Orlando these days. 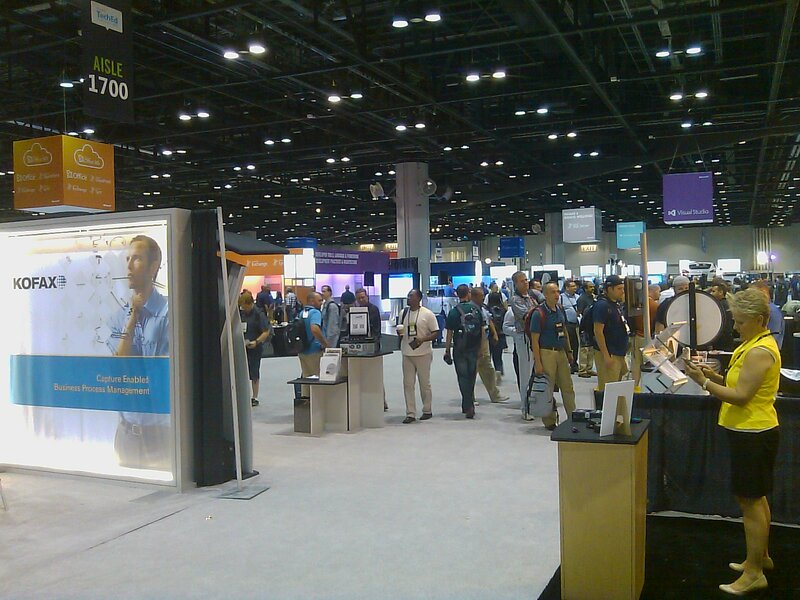 TechEd is Microsoft's premier technology conference for IT professionals and developers, offering the most comprehensive technical education across Microsoft's current and soon-to-be-released suite of products, solutions, tools, and services. Swing by our booth, say hi to Bob and Mark (pictured) and get scanned. We are looking forward to establishing new relationships on a solid common ground. World IPv6 Launch - are you ready? Major Internet Service Providers (ISPs), home networking equipment manufacturers, and web companies around the world are coming together to permanently enable IPv6 for their products and services by June 6th 2012. As the successor to the current Internet Protocol, IPv4, IPv6 is critical to the Internet's continued growth as a platform for innovation and economic development. On June 8th 2011, was the successful one-day World IPv6 Day event held worldwide but in many cases companies reverted back to IPv4. 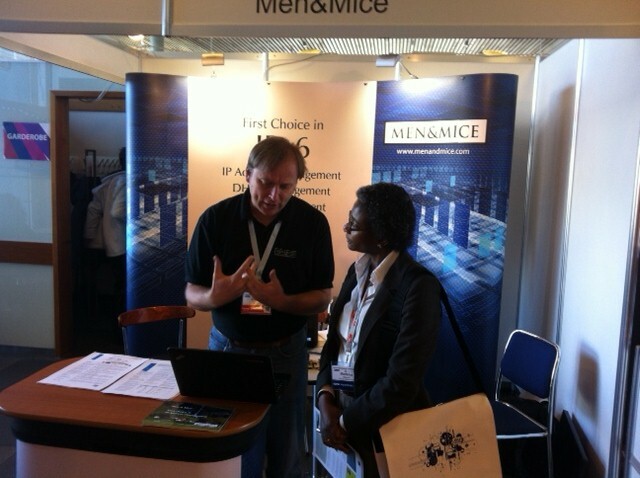 Men & Mice however continued on the IPv6 route and we haven't looked back since! Each day will include parallel sessions of presentations on a diverse range of topics, and there will be four more plenary talks, on Tuesday and Wednesday. All streams are available live and will be made available in archive form immediately after each session. Most of the slides and some of the papers can be downloaded by clicking on the relevant session in the programme, at https://tnc2012.terena.org/core/schedule/list. Streaming is undertaken by a technical team with members from the University of Iceland and RHnet, the Icelandic National Research and Education Network which are also kindly hosting the event. Here is our very own Carsten Strotmann, ready in our booth at the conference. He will also be giving a talk later on. Gartner has released its annual Marketscope on the DDI market for 2011-2012. In 2011, Gartner estimated that the DDI market generated approximately $290 million, representing a 36% increase over 2010. Gartner estimates that the market will grow another 29% in 2012, to approximately $380 million, as more enterprises seek tools to improve the operational effectiveness and the overall stability of DNS and DHCP. Gartner estimates that IPAM is the primary driver in more than 60% of DDI projects. Many enterprise networks are still managing their IP address space manually via spreadsheets (approximately 75%), via homegrown applications or a combination of the two. Microsoft’s entrance to this market highlights the increase importance of the DDI market. Men & Mice moves into the Caution category from last year’s Promising status. Men & Mice is the only global vendor solely focusing on Overlay solutions and as before Gartner recommends that SMBs as well as large enterprises seeking an Overlay solution with strong administrative controls should consider the Men & Mice Suite. Gartner highlights external factors as our main challenges. With Windows Server 8, Microsoft is entering this market segment. This is considered a challenge and the same applies to Overlay market shrinking. The fact that Microsoft is entering this market with an Overlay solution suggests increased focus on the Overlay market segment which contradicts market shrinking. Men & Mice has primary focus on medium to large enterprise networks so the overlap with Microsoft SMB product will be limited. Instead our solution is a natural extension and a professional upgrade of the Microsoft tools as it has been in the past with Microsoft snap-in. Gartner also mentions our hardware plans. Explosion in cloud based services and virtualization requires flexible DDI and focus on hardware based appliances will decrease, except for more dedicated purposes. Based on this Men & Mice has started to offer DNS caching only appliance but that is outside of the scope of the Gartner report. Men & Mice will continue to keep strong focus on the Overlay market segment and further build on our success there. 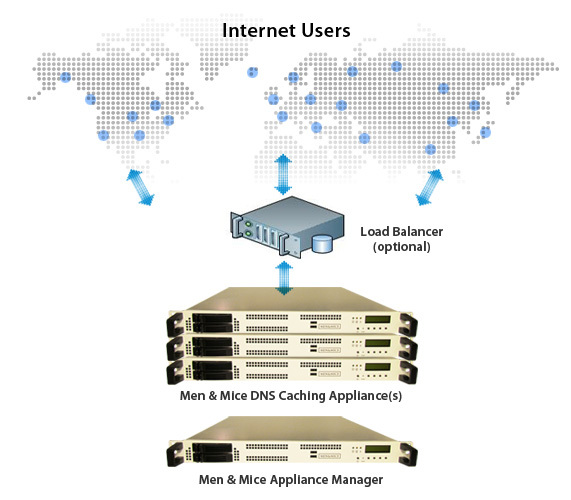 Men & Mice will also in the near future expand its product offerings using the core developed both in the Men & Mice Suite and in the Men & Mice DNS caching appliance. We at Men & Mice have continued to add to our growing customer base and today Men & Mice is stronger than ever. We see new opportunities with Microsoft putting more focus and effort into our market segment as well as through new Men & Mice products. Gartner continues to highlight some of the Men & Mice Suite strengths. Broad overlay support as the solution can centrally manage Microsoft, Linux and Cisco DNS and DHCP services. Men & Mice, a leading provider of DNS, DHCP and IP Address Management (IPAM) solutions, has announced the release of Men & Mice Suite version 6.3.1. Version 6.3.1 of the Men & Mice Suite contains various new features and usability enhancements, making the system more powerful and easier to use. originally published at DNS Workshop. DNSSEC has many useful properties. One is called 'Authenticated denial of existence'. This basically means that a DNSSEC validating DNS Server can prove that domain-names and resource records do not exist in the DNS. But how does NSEC and NSEC3 work. And how to choose good values for NSEC3 salt and iterations? It requires some 'out of the box' thinking to understand how DNSSEC can prove things that do not exist. The solution is to list all the things (DNS Names and Resource Records) that do exist, and secure that list. If that list can be proven, then everything not listed must not exist. This property of DNSSEC prevents an attacker from sending fake negative DNS responses, like 'google.com -> NXDOMAIN', which could be used for denial of service attacks. myzone.example.com. 3600 IN NS dns1.myinfrastructure.org. myzone.example.com. 3600 IN NS dns2.myinfrastructure.org. myzone.example.com. 3600 IN MX 10 mail.myinfrastructure.org. In this simple zone, we have two domain names (myzone.example.com. and www.myzone.example.com. ), and each domain name owns one NSEC record, listing all the resource record types that exist for that name, and pointing to the next domain name in the zone (in lexicographical order). The last NSEC record wraps around and points to the very first domain name in the zone. It is important to know that NSEC3 also enables a new function in DNSSEC, called 'opt-out'. With 'opt-out', it is possible to 'jump-over' (delegation) domain names in a zone where the child zone itself is not DNSSEC signed (it does not increase the security to provide a secure delegation in case the child itself is insecure). Zone administrators can decide to deploy NSEC3 to prevent zone walking, or to use 'opt-out', or both. Top-Level zone administrators choose NSEC3 because of this 'opt-out' function. This needs to be taken into account when looking at the NSEC3 parameters of DNSSEC signed zones. In this blog post I will look into the NSEC3 parameters that prevent 'zone-walking', and I will not discuss 'opt-out'. NSEC3 cannot prevent 'zone-walking' entirely, but it can make 'zone-walking' more expensive for the attacker. There are two parameters in NSEC3 that can be set by the administrator of a zone to fine tune the amount of work required on the attacker side to 'walk' a DNSSEC signed zone with NSEC3 records: the salt and the number of iterations. The first NSEC3 record is for the name "www.myzone.example.com. ", while the last one is for the zones apex ("myzone.example.com."). The NSEC3 records in a DNSSEC signed zone are not in the proximity of the domain names they are securing (but the list of record types can give a hint). An attacker needs to create a rainbow table to be able to 'walk' a NSEC3 zone. A rainbow table lists precomputed hashes for common domain names in that zone. The attacker will take the hashed domain names returned in an NSEC3 resource record and will compare the hash with the values in the rainbow table. If the hash matches one entry in the table, the clear text of the domain name is found. The alternative approach would be to brute force try all possible domain names and send queries to the zone. However this approach might be detected if the DNS queries towards the authoritative DNS servers are monitored (and you monitor the queries towards your DNS, do you?). Using a rainbow table the attacker can first collect all hashed domain names by following the NSEC3 linked-list, and then try to reverse the hashes using the rainbow table in the privacy of his own environment. The input to the hash is always the full qualified domain name (like 'www.myzone.example.com. '), so the address records pointing to a web-service "www" in two different zones will hash into different hash values. An attacker will need to create a dedicated rainbow table for each DNS zone. But once the table is calculated and working, the attacker can re-use the table for every subsequent scan. The salt value is public (it is in the NSEC3PARAM record in the zone, and in every NSEC3 record). It must be public, because a validating DNS server must know the salt value to be able to validate the NSEC3 records coming in a negative DNS answer. Because it is public, attackers can fetch the value from the zone to generate a rainbow-table. Therefore, the salt needs to be changed from time to time. Whenever the salt is changed in a zone, the attacker needs to throw away any pre-computed rainbow-table for the zone and start re-creating the table from scratch. If the salt is changed in intervals shorter than the time it takes to compute a reasonable large rainbow-table, it makes 'zone walking' impossible. RFC 5155 that defines the NSEC3 record recommends to change the salt whenever a zone is signed. Because a new salt will change all NSEC3 records, and all RRSIG records for the NSEC3 records, this is quite some overhead for a large zone. The RFC draft 'draft-ietf-dnsop-rfc4641bis-08' recommends to change the salt whenever the zone signing key is rolled (because that triggers re-generation of all signatures anyway). The salt can be up to 510 hexadecimal characters, but in practice, using 8-16 hexadecimal characters is a good value (32-64 bit). It is recommended to automate the salt generation: whenever a new zone signing key (ZSK) is generated, there should be a new salt generated. The second parameter important for the NSEC3 hash function is the number of iterations (3rd field in the NSEC3 and NSEC3PARAM records). As computer become more powerful over time, it might be possible to calculate rainbow tables in a short amount of time. The number of iterations in NSEC3 controls how often the result of the first hash operation is hashed again (so even with iterations=0, the domain names are hashed once). By increasing the number if iterations, calculating a rainbow table can be made more expensive. But it also makes sending negative answers more expensive for authoritative DNS servers hosting the zone, as well as validating these answers on the receiver side. The number of iterations must be carfully balanced, a too high number can invite denial-of-service attacks agains the zones authoritative servers. The current default value for NSEC3 iterations in BIND 9.8 is 10 iterations. the number of iterations is always a compromise between security and CPU usage. The default in the BIND signing tool is a good value for most zones, but every administrator should evaluate if the default is also good for her/his zones. NSEC3 records that use too high iteration values will be seen as 'insecure' by a validating DNSSEC resolver! (see RFC 5155, 12.1.4). RFC 4641bis recommends 2/3 of the maximum value. For a 1024 bit ZSK this would be 100 iterations. If you wish to prevent 'zone walking', then sign your zone with NSEC3. If you don't mind (DNS data is public data), use plain NSEC. if your domain is a 'important enough target' (whatever that might be), and there is risk that someone creates a rainbow-table for your zone, schedule a change of the NSEC3 salt parameter every time you roll your zone signing key. from time to time re-evaluate the number of hash iterations used in your NSEC3 signed zone, based on the advances in computing power that might be available to a potential attacker. What values do the others use? Dmitry Kohmanyuk was on a "NSEC3PARAM salt hunt"
Thanks to Peter Koch, Alan Clegg and Miek Gieben for valuable input and answering my questions.